Served warm or cold these tarts are sure to please. Replace the asparagus with some confit onion cooked with poitin marmalade for a flavoursome variation. Place a large pan of salted water on a medium heat and bring to the boil. Prepare a bowl of ice cold water on the side. Add the asparagus to the boiling water, simmer for 2 to 4 minutes depending on the size of the asparagus. Remove the asparagus from the water using a slotted spoon and place in the ice-cold water. This will stop the cooking of the asparagus keeping them green and crunchy. Remove the asparagus from the cold water and transfer to a bowl with half the melted butter, add the broad beans, lemon zest and juice, then season well. Roll the pastry on a lightly floured surface then transfer to a baking tray. Lightly brush the pastry with some melted butter, then add the seasoned vegetables. 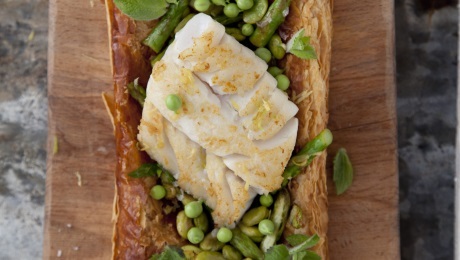 Top with the cod fillets and transfer to a preheated oven for 18 to 20 minutes. Serve immediately with some salad.